When it comes to choosing a smartwatch, do you really need to spend $370 on a device that almost does more than your phone—including reminding you to breath? No. The Pebble has always been about simplifying the smartwatch, and even with improved fitness features, the Pebble 2 remains exactly as much smartwatch as you really need. The original Pebble, now known as the Pebble Classic. While companies like Apple and Samsung try to cram as much functionality into a wearable device as technology allows, Pebble continues to take a simpler approach, focusing on the best uses for having a second screen strapped to your wrist. And while the Pebble 2+ Heart Rate isn’t quite as simple as the original, its fitness tracking upgrades are a welcome addition that never bring the Pebble 2 down. If you can remember all the way back to 2012, the original Pebble hit Kickstarter with a $150 price tag that reflected its basic functionality. It could show notifications, do basic fitness tracking, and shrug off water, but it also only had a simple black and white LCD display, and a reliance on physical buttons to navigate its UI, instead of a touchscreen. We’ve seen these before, but a heart rate sensor is a welcome addition to the Pebble 2. So what’s new? The most obvious upgrade to the new Pebble is the addition of a photoplethysmography, or PPG, sensor on the back. It’s the same heart rate monitor method used by nearly every other wearable on the market. PPG uses a pair of LEDs to blast multiple light into the wearer’s skin, and a camera to detect how that light is then scattered. Depending on the flow of blood under the skin, the light scatters in different ways, allowing the Pebble 2 + Heart Rate to monitor the wearer’s heart rate. Pebble already updated its mobile app to make it more fitness-friendly, but it now provides access to your heart rate data too. The recent fitness-focused updates to the Pebble app, available for iOS and Android devices, now includes the ability to keep tabs on your heart rate throughout the day as the Pebble 2 + Heart Rate takes periodic measurements, depending on your level of activity, to conserve battery life. But you can also activate a ‘Workout’ mode on the smartwatch, specifying various levels of physical activity, to force the heart rate monitor to take constant readings. More and more dedicated fitness trackers with heart rate tracking capabilities have been gaining smartwatch-like features, but few work as well as the Pebble do—which is a smartwatch first. If you’re already a fan of Pebble’s wearables, this improved fitness tracking functionality is a welcome upgrade since it means you don’t have to wear a second device, or abandon the smartwatch you’ve come to love. Now do you really need a heart rate monitor strapped to your wrist 24/7? No. Believe it or not, humans managed to stay active and fit well before the words fitness and tracker were ever placed side-by-side. For some people, however, a constant update on how lazy they’re being can be a great motivator to get up off the couch. And given how cheap the hardware has become, it just makes sense for Pebble to jump on the heart rate bandwagon. If the addition of the PPG sensor on the back of the Pebble 2 had resulted in a big uncomfortable bulge sticking out, or the wearable doubling in size, it would have certainly been a misstep for the product. But the new features are unobtrusive when you don’t need them, and surprisingly robust given the limitations of the Pebble hardware. The Pebble app gives you a thorough breakdown of your day to day fitness stats—steps, calories burned, distance, active minutes—and compares it to your average performance on a given day. While not as robust as the stat tracking you’ll find for dedicated fitness trackers, the Pebble 2 provides more than enough information for those of us who know we should be more active, and want to be reminded of the fact. And if the Pebble mobile app’s UI isn’t working for, all the of data the Pebble 2 collects can be shunted over to Apple’s HealthKit. Pebble put the Pebble 2 on a much needed diet, resulting in a thinner, sleeker smartwatch that looks so much better than the original. The other big improvement with the Pebble 2 is its design, which is now much sleeker than the original, but still very much reminiscent of the Pebble Classic— if, for some reason, you have a soft spot for the original’s bulky square look. I have to admit, the original Pebble’s design was a complete dealbreaker for me. Yet the Pebble 2 is much thinner, making it feel less garish on the wrist, even with the new optical heart rate sensor protruding out the back. And the bezel surrounding its display doesn’t look as thick as it did on the original Pebble, even if it’s the exact same size and only appears thinner because of how the LCD panel is now being framed. The changes are minor, but I don’t mind the look of the Pebble 2 on my wrist, despite not being a fan of the original. The Pebble 2 has also gained a microphone, like the one you’ll already find on the Pebble Time, for sending text and voice replies right from your wrist. However, this functionality can still only be used when the smartwatch is paired with an Android phone, or with a select number of carriers when paired to the iPhone. It is far from being a key selling point for the wearable. There’s no fancy touchscreen here, just four buttons used to navigate the Pebble 2's streamlined UI. The Pebble 2 excels most in the places the Pebble Classic excelled before it. Pebble’s worked out a formula for a topnotch smartwatch and isn’t about to deviate. The Pebble 2 + Heart Rate has the same black and white LCD display as the original, without touch functionality, and the same user interface as all the Pebble smartwatches preceding it. You’ll still be relying on a set of four physical buttons to hop around menus, scroll through your notifications, and check your daily schedule. If you’re trying to impress your friends with the latest and greatest smartwatch on your wrist, the Pebble 2 simply isn’t for you. The Pebble 2's low-res display hasn’t seen much improvement, but it’s still completely functional. Navigating a mobile device with a screen without being able to touch it does take some getting used to, but eventually I found myself not missing the touchscreen. Particularly since it means the Pebble 2 can survive for upwards of seven days without a charge. Do you really need to be able to send doodles from your wrist to your friends? I don’t. Having worn the Pebble Time with its color display for the past year, I did find the black and white display on the Pebble 2 limiting. Notifications on the Pebble Time are color-coded, making it easy to distinguish between an important email, an urgent text message, and an ignorable Twitter update at a quick glance. But it’s not quite as easy with the Pebble 2's monochrome display, and it’s something I would consider to be a major drawback to Pebble’s basic offering. A magnetic charging cable is easy to attach, but a stronger magnet would prevent it from easily popping off. In the past we have complained about the weak magnets used to secure the charger to the Pebble wearables, and unfortunately it doesn’t appear as if that’s changed with the Pebble 2. So if you accidentally bump the watch while it’s charging on your nightstand in the middle of the night, there’s a chance the cable will pop off, but that still beats trying to plug in a tiny microUSB cable. Unlike the Apple Watch, which in the coming years will most likely replace the iPhone altogether, the Pebble’s raison d’être has always been as a cheap sidekick to your mobile device, with great battery life, that puts notifications and other important information on your wrist where it’s always easily accessible at a glance. It’s greatest feature has always been its simplicity. So had the Pebble 2 + Heart Rate arrived with an inflated price tag as a result of its fitness tracking upgrades, it would have been hard to recommend it when the original Apple Watch is now $269. 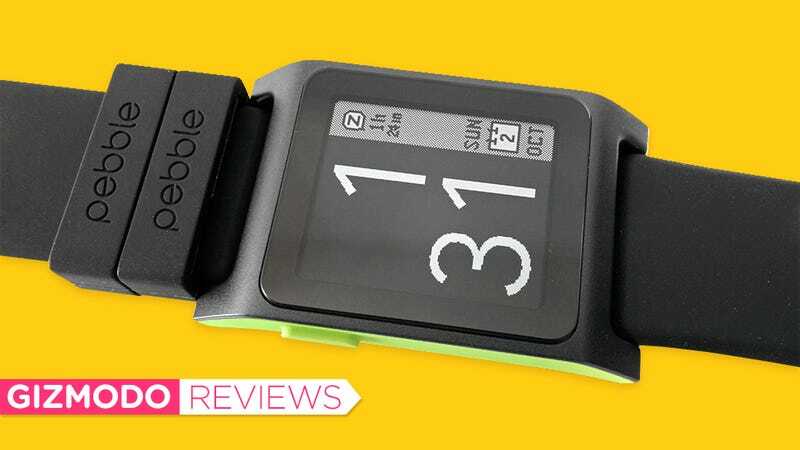 But at $130, which is actually $20 cheaper than the original Pebble Watch first sold for, the Pebble 2 is a fantastic bargain if you’re just dabbling in smartwatches, or want a well-equipped fitness tracker with additional functionality. At $130, the upgraded Pebble 2 + Heart Rate is actually $20 less than the original Pebble sold for. The addition of a heart rate monitor makes the Pebble 2 a fantastic and affordable waterproof fitness tracker as well. The Pebble mobile app provides a detailed but streamlined look at your fitness stats, but the data, including your heart rate, can also be synced with Apple HealthKit. Its monochromatic, non-touch LCD display means you’ll have to rely on physical buttons for navigating the UI, but it gives the Pebble 2 almost seven days of battery life. That black and white display means you don’t get the color-coded notifications available on the Pebble Time, which are easier to distinguish at a glance. A slimmer design, and a visually minimal bezel around the display, drastically improves the Pebble 2's appearance. The glass lens over the display will resist scratches, but the plastic housing is prone to getting easily dinged up.